16" Steel Combination Hanger w/ Vinyl Cushion Clips and Loop Hook,(Box of 100). 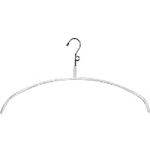 Sturdy unbreakable steel hanger excellent for salesmen, showrooms or other professional uses. Used for blouses, skirts and slacks. Has two (2) chrome plated clips.